For quite some time, Colin has exhibited a real love for music. I can't imagine where on earth he gets that from! I have sung to Colin (all three boys, actually) since he was a small baby, and he has always responded really well to music. He has always loved listening to music.....now, he is beginning to love to create music as well. As someone who absolutely loves music, you can't imagine how much it thrills me to hear my 3-year-old singing along to the radio, singing to Ethan, making up his very own songs, singing to veggie tales videos, singing in church (I mean, really, really trying to actually sing the song the right way, with the hymnal open and everything)....and now, he is showing a real interest in musical instruments. I have let him play on the piano since he was a baby. Even before he was a year old, he knew how pull out the piano bench, climb up it, sit there and open the piano, and bang on the keys. I taught him how not to bang, but to play gently, and he still loves to do that to this day. We have even practiced learning some easy songs together. 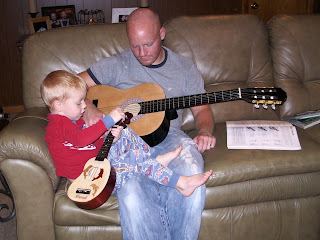 He can even play them--with Mommy's help guiding his fingers! Cameron is beginning now to show an interest in the piano, too. It took him longer to come around, musically speaking. He didn't respond to my singing the same way Colin and Ethan did as small babies--in fact, my singing, rather than calming him down like it did the other two, actually made Cameron cry harder. **Insert your laugh and joke about my bad singing scaring him here. ** But now, I find it is difficult to keep Cameron off of the piano! I know a big part of why he loves to play is because he watches everything Colin does, and wants to do it as well....but I don't really care what the reason is, I am just thrilled that they have the desire right now to learn about these things! A couple of nights ago, Shane's best friend Justin came for a visit, and Justin is a really great guitar player--self taught. Shane, for some time now, has wanted to learn how to play himself, and he got a guitar a couple of years ago for his birthday. He has had soooo much going on in the last couple of years that he has really not been able to devote much time to learning how to play, but Justin's visit sparked that interest in him all over again, so the guitar came out of hiding. Of course, the guitar is something brand new to the boys, and has absolutely fascinated both of them. 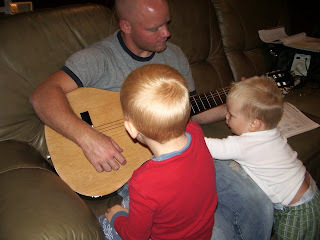 Shane was practicing on Saturday night, after we had put the boys in their beds to read for a few minutes before lights out. We do that alot--they love books, too, (just like Mommy) so we read a couple together, and then give them the same books we just read to "re-read" themselves . I was practicing the piano while Shane was practicing the guitar, and I looked up, because I saw something out of the corner of my eye. 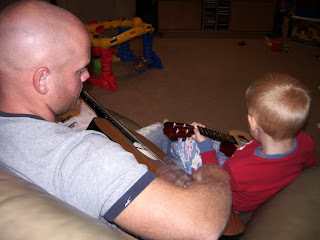 There was Colin, who had found his "guitar" in his closet, pulled it out, and was playing it along with his daddy! I told him to come on out of his room (of course, Cameron followed). It was so cute....Colin's guitar is actually a ukelele that we bought for him when we went to Hawaii, and it is the perfect size for him. It certainly does the job and he looks so cute playing it! He loves it, which is the most important thing. 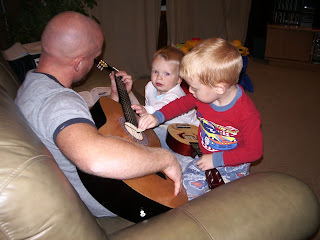 The boys played with Daddy and Mommy on the instruments for awhile, and then it was off to bed--for real, this time. It is so cool to have a house filled with music--and even better that now, it is not ALL coming from me! What great memories! I would love to get Elijah into piano lessons in the next year or two. hey dev! haven't talked to you in a while. how are ya? ok well had a dream about you last night? you were on #4??? I know just a dream but it seemed so real! k talk to ya later! How cute the Von Trap family :) Hey do your boys like musical classics (vidoes)? My boys love "sound of music" and "chitty chitty bang bang" gotta try them out if you haven't (shane is probably killing me for saying that right now huh). I just love all the songs in those movies and they ARE GOOD movies at that! I can only imagine how fun that would be. I didn't remember that you played the piano? When did you start playing? Aim--SHUT IT. Seriously. Love ya though, hee hee. :-) Heather--does that answer your question about #4? And, my boys LOVE the sound of music...it is one of their favorites! We haven't tried Chitty yet, but they also love Mary Poppins. Jill, I took one semester of lessons in college to learn the basics (always was a dream of mine to learn), the rest was just lots and lots of practice! I am the pianist for my church now; not a great one, but they take me, which I am so thankful for! I love it. dev, I was just telling you my dream. that is all. also I wanted to email you anyway and tell you I was shocked that I didn't hear you on the radio this morning trying to get 2nd row tickets to Steven Curtis Chapmann? All you had to do was finish the song and I thought for sure you would jump on that. It was at 7:30 this morning but other than that.... I think they are doing it again at like 4 or so today??? just letting you know. rog said he wouldn't mind going to that concert??? maybe we should work something out? a weekend thing??? who knows.